Please phone Eppy to discuss your personalized catered affair. All catering orders require 24 hours notice. Having a party or an event? 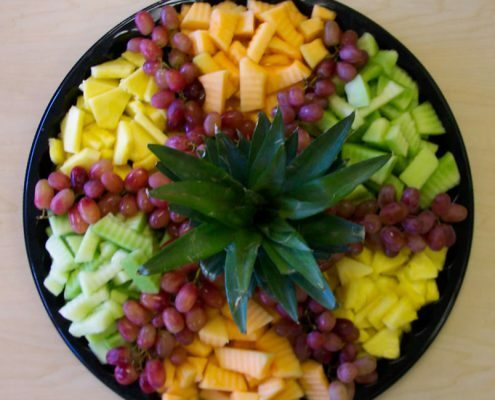 We have a wide selection of catering options to select from. 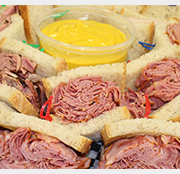 Omnitsky’s is a full-service kosher caterer and take-out for all occasions. 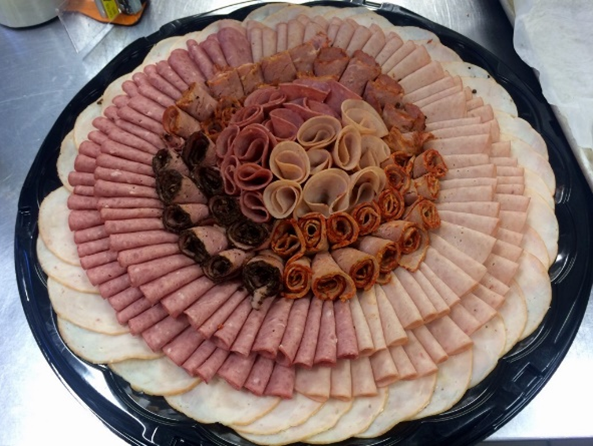 We have deli platters of meat selections, sandwich platters, vegetable trays, condiment trays, fresh fruit trays, party subs, and full meals. 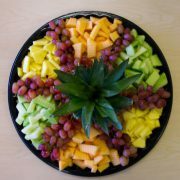 Contact us for menu options for your special event. We deliver – call for details. All our selections are produced in house and are made traditionally – prepared by hand one at a time, to ensure everything turns out juicy and tasty. All these products are gluten-free and smoked in an all-natural wood chip smoke house. The difference between pastrami, corned beef, and smoked meat: all are pickle brine based, but corned beef gets boiled, and rolled in Hungarian paprika – the mildest in flavour profile. Smoked meat gets rolled in a combination of spices, (Hungarian paprika, cloves, peppercorns, and sugar) cooked in an all-natural wood chip smoke house. Pastrami gets rolled in a rub of primarily black peppercorns, and cooked in an all-natural wood chip smoke house – it is the spiciest of the three. 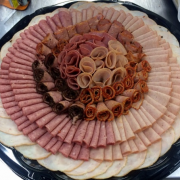 This will serve 20 hungry people and contains our world famous chopped liver in the center – sorry but it is better than your mom’s or your baba’s, surrounded by pastrami, all-natural oven roast beef, corned beef, Montreal-style smoked meat, and smoked turkey breast. Included in this “deli deluxe platter” is a display bowl of our coleslaw (oil and vinegar, an old Winnipeg recipe that goes back to the 1950s), our house potato salad, deli breads, condiments, cutlery and plates. 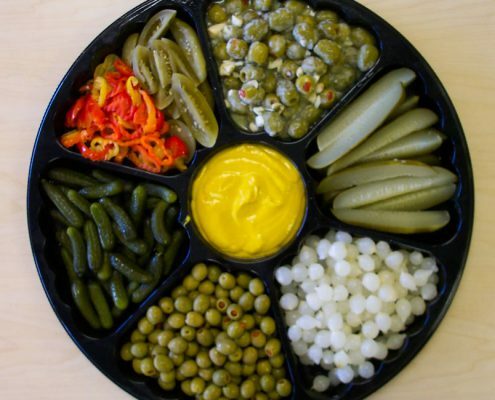 Our condiment tray includes pickles, pickled onions gherkins, garlic and hot olives (both made in house), and mustard. Some other choices that can be included are pickled tomatoes and hot peppers. 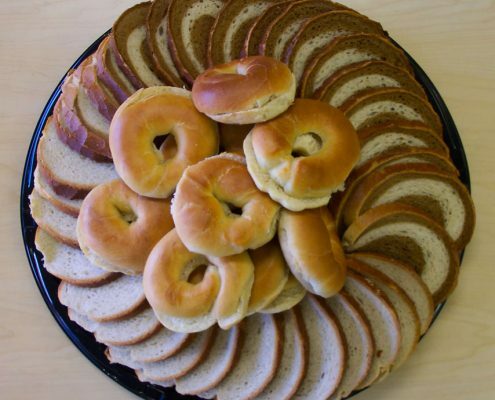 The bread tray has assorted breads with your choice of fresh New York rye, caraway rye, marble rye, and bagels. assorted vegetable tray & pastry tray.